Dr. William J. Hagerty has been dedicated to offering professional dental care in a friendly environment for over thirty years in the Dayton area. After graduating from Archbishop Alter High School in 1975, he received his Bachelor of Science degree in Chemistry from the University of Notre Dame. Due to his academic performance, he was accepted early into The Ohio State University School of Dentistry where he completed his Doctorate of Dental Surgery degree. Dr. Hagerty has continued his education extensively in the areas of Orthodontics, Endodontics, Periodontics, Oral Surgery, Implantology, Cosmetic Dentisty, and is licensed to perform I.V. Sedation. 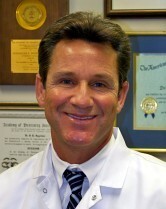 He is also a member of the Dayton Dental Society, the Ohio Dental Association and the American Dental Association.